Rhinovirus (RV), a ssRNA virus of the picornavirus family, is a major cause of the common cold as well as asthma and chronic obstructive pulmonary disease exacerbations. Viral dsRNA produced during replication may be recognized by the host pattern recognition receptors TLR-3, retinoic acid-inducible gene (RIG)-I, and melanoma differentiation-associated gene (MDA)-5. No study has yet identified the receptor required for sensing RV dsRNA. To examine this, BEAS-2B human bronchial epithelial cells were infected with intact RV-1B or replication-deficient UV-irradiated virus, and IFN and IFN-stimulated gene expression was determined by quantitative PCR. The separate requirements of RIG-I, MDA5, and IFN response factor (IRF)-3 were determined using their respective small interfering RNAs (siRNA). The requirement of TLR3 was determined using siRNA against the TLR3 adaptor molecule Toll/IL-1R homologous region-domain-containing adapter-inducing IFN-β (TRIF). 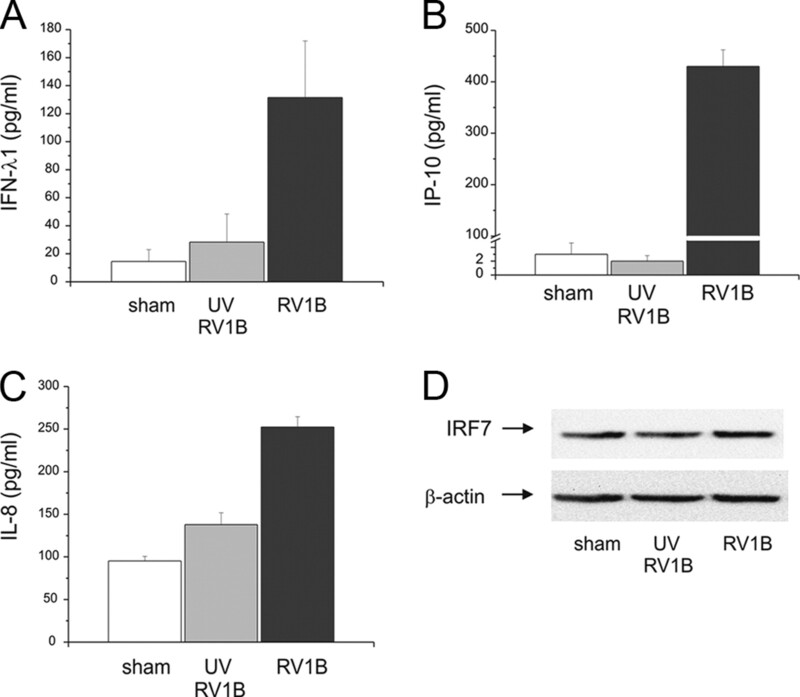 Intact RV-1B, but not UV-irradiated RV, induced IRF3 phosphorylation and dimerization, as well as mRNA expression of IFN-β, IFN-λ1, IFN-λ2/3, IRF7, RIG-I, MDA5, 10-kDa IFN-γ-inducible protein/CXCL10, IL-8/CXCL8, and GM-CSF. siRNA against IRF3, MDA5, and TRIF, but not RIG-I, decreased RV-1B-induced expression of IFN-β, IFN-λ1, IFN-λ2/3, IRF7, RIG-I, MDA5, and inflammatory protein-10/CXCL10 but had no effect on IL-8/CXCL8 and GM-CSF. siRNAs against MDA5 and TRIF also reduced IRF3 dimerization. Finally, in primary cells, transfection with MDA5 siRNA significantly reduced IFN expression, as it did in BEAS-2B cells. These results suggest that TLR3 and MDA5, but not RIG-I, are required for maximal sensing of RV dsRNA and that TLR3 and MDA5 signal through a common downstream signaling intermediate, IRF3. Viral infections, most commonly caused by rhinovirus (RV),3 are a frequent cause of asthma and chronic obstructive pulmonary disease exacerbations (1). RV is a nonenveloped, positive, ssRNA virus from the Picornaviridae family. RV is internalized by receptor-mediated endocytosis and undergoes a conformational change at endosome low pH, leading to insertion of viral RNA into the cytosol. After entry, replication occurs entirely in the cytoplasm, where ssRNA forms a dsRNA intermediate, the main form of viral RNA genome inside the cell. dsRNA produced during viral infection represents an important stimulus of the host innate immune response. It is recognized and engaged by three pattern recognition receptors (PRR). TLR3 is localized to the endosomal and plasma membranes. TLR3 senses dsRNA released from dying cells and signals through its unique adaptor protein-Toll/IL-1R homologous region (TIR)-domain-containing adapter-inducing IFN-β (TRIF; Ref. 2). The cytoplasmic proteins retinoic acid-inducible gene (RIG)-I and melanoma differentiation-associated gene (MDA)-5 have recently been identified as intracellular receptors for viral dsRNA (3, 4). RIG-I and MDA5 are homologous cytoplasmic helicases containing two N-terminal caspase activation and recruitment domains and a C-terminal DExD/H-Box RNA helicase domain. They bind to dsRNA through the helicase domain and signal through caspase activation and recruitment domains to a common adaptor molecule, IFN-β promoter stimulator-1 (also called VISA; Refs. 5 and 6). Engagement of TLR3, RIG-I, or MDA5 initiates signaling through two protein kinase complexes, TANK-binding kinase/IκB kinase (IKK)-ε and IKKα/IKKβ, leading to activation of IFN-regulated factor (IRF)-3 and NF-κB, respectively (7). Transcription factor activation, in turn, induces expression of IFNs and proinflammatory cytokines. Although all three receptors can recognize viral dsRNA, they appear to be specialized in their recognition of particular viruses. RIG-I and TLR3 are required for respiratory syncytial virus-induced expression of IFN-β, 10-kDa IFN-γ-inducible protein (IP-10) in airway epithelial cells (8). 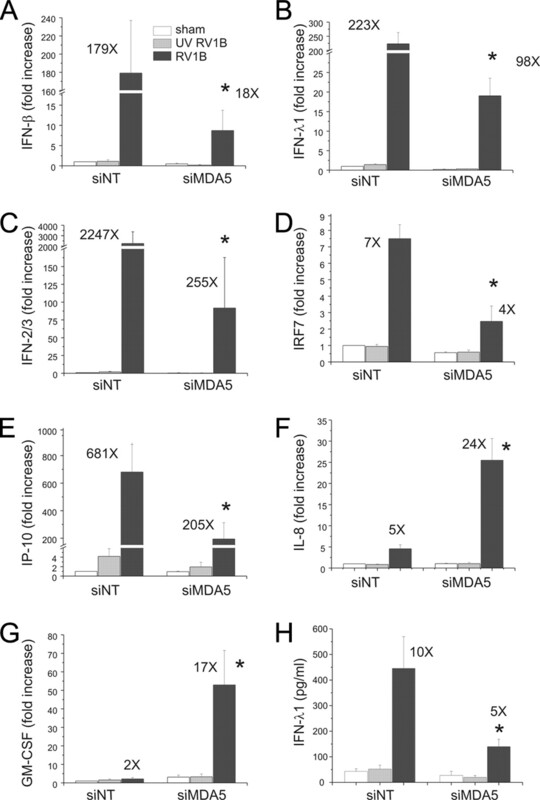 RIG-I-deficient mice fail to produce type I IFNs in response to the negative-sense ssRNA viruses Newcastle disease virus, Sendai virus, vesicular stomatitis virus, and influenza virus, and to the positive-sense ssRNA Japanese encephalitis virus, whereas MDA5-deficient mice fail to detect encephalomyocarditis (EMCV), a positive-sense ssRNA picornavirus (9). The engagement of PRRs is also cell-type specific: for example, whereas MDA5 is essential for induction of type I IFNs after infection with EMCV in fibroblasts and conventional dendritic cells (DC), plasmacytoid DCs use the TLR system for viral detection (9). Little is known about the contributions of the various pattern recognition receptors to RV-induced responses in bronchial epithelial cells. Primary human bronchial epithelial cells express TLR3, and the TLR3 ligand poplyinosinic-polycytidylic acid (poly(IC)) elicits a strong proinflammatory response in these cells (10, 11). In 16HBE14o− human bronchial epithelial cells, TLR3 is primarily localized in the endosomes but not cell surface (12). TLR3 is partially required for RV39-induced IL-8 expression in 16HBE14o− cells (12) and RV1A-induced MUC5AC expression in NCI-H292 mucoepidermoid carcinoma cells (13). However, the requirement of either RIG-I or MDA5 for RV-induced responses has not yet been tested. In this study, we found that MDA5 and TLR3, but not RIG-I, are required for RV-induced IFN responses in human airway epithelial cells. BEAS-2B human bronchial epithelial cells, a SV40-transformed airway bronchial epithelial cell line, were purchased from American Type Culture Collection (ATCC). Cells were grown on collagen-coated (5 μg/cm2) plates in bronchial epithelial growth medium (BEGM; Lonza) containing epidermal growth factor (25 ng/ml), bovine pituitary extract (65 ng/ml), all-trans-retinoic acid (5 × 10−8 M), hydrocortisone (0.5 μg/ml), insulin (5 μg/ml), transferrin (10 μg/ml), epinephrine (0.5 μg/ml), triiodothyronine (6.5 ng/ml), gentamicin (50 μg/ml), and amphotericin (50 μg/ml). Primary tracheal epithelial cells were all isolated from the tracheas of lung transplant donors, as described (14, 15). Submerged cells were grown as monolayers to 80–100% confluence in BEGM containing epidermal growth factor (25 ng/ml), bovine pituitary extract (130 ng/ml), all-trans-retinoic acid (5 × 10−8 M), and BSA (1.5 μg/ml). RV1B and RV39 were obtained from ATTC. Viral stocks were generated by incubating HeLa cells with RV in serum-free medium until 80% of the cells were cytopathic. Viral stocks were concentrated, partially purified, and titered as previously described (14, 15). RV1B was irradiated with UV light at 100 μJ/cm2 for 10 min on ice, using a CL-1000 cross-linker (UVP). Total RNA was extracted using the RNeasy kit (Qiagen) and then transcibed to first-strand cDNA using Taqman Reverse Transcription Reagents (Applied Biosystems). First-strand cDNA is then used to quantify the expression of IFN-α, IFN-β, IFN-λ1, IFN-λ2/3, IRF-7, IP-10/CXCL-10, IL-8/CXCL8, and GM-CSF mRNA levels by qPCR using specific primers and probes. BEAS-2B cells were grown to 80% confluence and infected with RV1B or medium alone for 1 h. Inoculum was then replaced with BEGM. After 24 h, supernatant was collected for the measurement of IFN-λ1, IP-10/CXCL-10, and IL-8/CXCL-8 protein by ELISA (R&D Systems). Cells were lysed with radioimmunoprecipitation buffer (50 mM Tris (pH 7.4), 150 mM NaCl, 5 mM EDTA, 50 mM NaF, 1% Nonidet P-40, 10% glycerol). Into each well were loaded 30 μg of protein lysate. Lysates were resolved by SDS-PAGE. Proteins were transferred to nitrocellulose or polyvinylidene difluoride membrane. Membranes were blocked in 5% milk for 1 h at room temperature and probed with mouse anti-RIG-I (Alexis Biochemicals), goat anti-MDA5 (Santa Cruz Biotechnology), rabbit anti-IRF3 (IBL America), rabbit anti-TRIF (Cell Signaling), or rabbit anti-IRF7 (Abcam). Ab binding was detected with a peroxidase-conjugated anti-mouse, anti-rabbit, or anti-goat IgG and chemiluminescence. The 19-bp duplex of targeting siRNA or nontargeting siRNA (Dharmacon) was transfected into subconfluent BEAS-2B cells while cell seeding, using RNAiMAX in OptiMEM (Invitrogen). A pool of double-stranded siRNAs containing equal parts of the following antisense sequences was used to knock down RIG-I: 1, 5′-GCACAGAAGUGUAUAUUGG-3′; 2, 5′-CCACAACACUAGUAAACAA-3′; 3, 5′-CGGAUUAGCGACAAAUUUA-3′; 4, 5′-UCGAUGAGAUUGAGCAAGA-3′. The nontargeting siRNA sequence was 5′-CGAACUCACUGGUCUGACCdtdt-3′ (sense), 5′-GGUCAGACCAGUGAGUUCG-dtdt-3′ (antisense). For knockdown of MDA5, a pool of the following sequences was used: 1, 5′-GAAUAACCCAUCACUAAUA-3′; 2, 5′-CACGAGGAAUAAUCUUUA-3′; 3, 5′-UGACACAAUUCGAAUGAUA-3′; 4, 5′-CAAUGAGGCCCUACAAAUU-3′. For knockdown of IRF3, a pool of the following sequences was used: 1, 5′-CGAGGCCACUGGUGCAUAU-3′; 2, 5′-CCAGACACCUCUCCGGACA-3′; 3, 5′-GGAGUGAUGAGCUACGUGA-3′, 4, 5′-AGACAUUCUGGAUGAGUUA-3′. For knockdown of TRIF, a pool of the following sequences was used: 1, 5′-GGAGCCACAUGUCAUUUGG-3′; 2, 5′- CCAUAGACCACUCAGCUUU-3′; 3, 5′-GGACGAACACUCCCAGAUC-3′; 4, 5′-CCACUGGCCUCCCUGAUAC-3′. The next morning, cells were incubated in fresh BEGM for 24 h. Finally, cells were treated with the relevant stimulus in BEGM medium for 1 day before harvest. SigmaStat computing software (SPSS) was used for data analysis. Data are represented as means ± SEM. Normality was tested using the Kolmogorov-Smirnov test. Statistical significance was assessed by either one-way ANOVA or the Kruskal-Wallis one-way ANOVA based on ranks, whenever appropriate. Differences identified by ANOVA were pinpointed by the Student-Newman-Keuls multiple range test. To test whether RV induces an IFN response in human bronchial epithelial cells, BEAS-2B cells were infected with intact RV1B or UV-irradiated RV-1B for 1 h at 33°C. Cellular total RNA was extracted from lysates to measure the gene expression at 1, 8, 18, 24, 48, and 72 h postinfection by quantitative PCR. 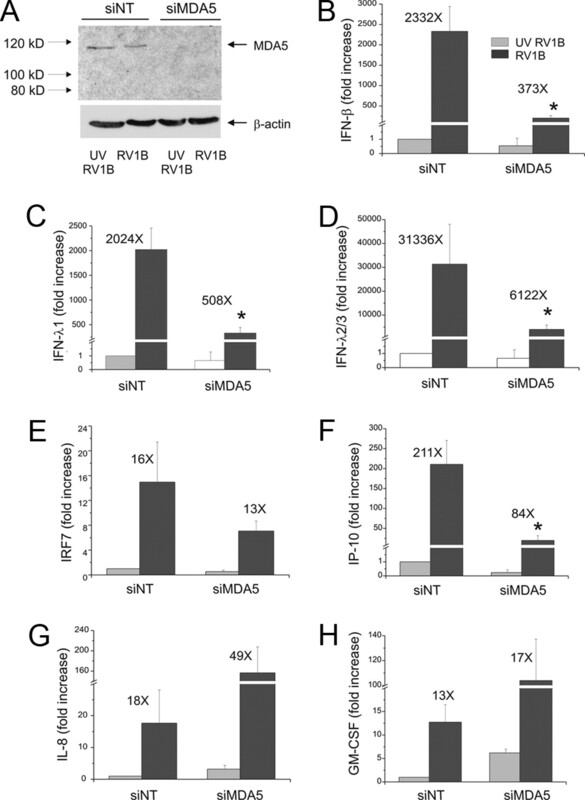 Compared with replication-deficient UV-irradiated virus, intact RV1B increased the mRNA expression of IFN-β, IFN-λ1, and IFN-λ2/3, as well as the expression of several IFN-stimulated genes (ISG) including IRF7, RIG-I, MDA5, and TLR3 (Fig. 1⇓). The peak level of mRNA expression was 24 h postinfection, except in the case of IFN-β, which was 48 h postinfection The fold-induction varied widely, from 4-fold (TLR3) to ∼27,000-fold (IFN-λ2/3). Fold increases in IFN and ISG mRNA expression tended to be higher for genes expressed at lower levels as baseline, as measured by cycle number (Table I⇓). RV1B infection also increased the protein expression of IFN-λ1, IP-10/CXCL-10 and IL-8/CXCL-8 (Fig. 2⇓, A–C). However, there was no induction of IRF7 protein expression (Fig. 2⇓D). Nevertheless, these data, combined with increases in RIG-I and MDA5 protein abundance (see below), demonstrate that RV induces a robust, replication-dependent innate immune response at both the mRNA and protein levels. RV1B infection also increased IFN and ISG mRNA expression in primary tracheal epithelial cells (Fig. 3⇓ and Table II⇓). Fold increase of RV1B-induced IFN and ISG responses in cultured airway epithelial cells. BEAS-2B cells were infected with RV1B or sham-infected (1 h at 33°C). Total RNA was extracted at 1, 8, 16, 24, 48, and 72 h after infection. A–G, The expression of IFN-β, IFN-λ1, IFN-λ2/3, IRF7, RIG-I, MDA5, and TLR3 at each time point was determined by qPCR. The expression of each target gene was normalized to GAPDH. Expression levels are represented as the ratio of the response to intact RV vs the response to sham. Data represent means ± SEM for three experiments. 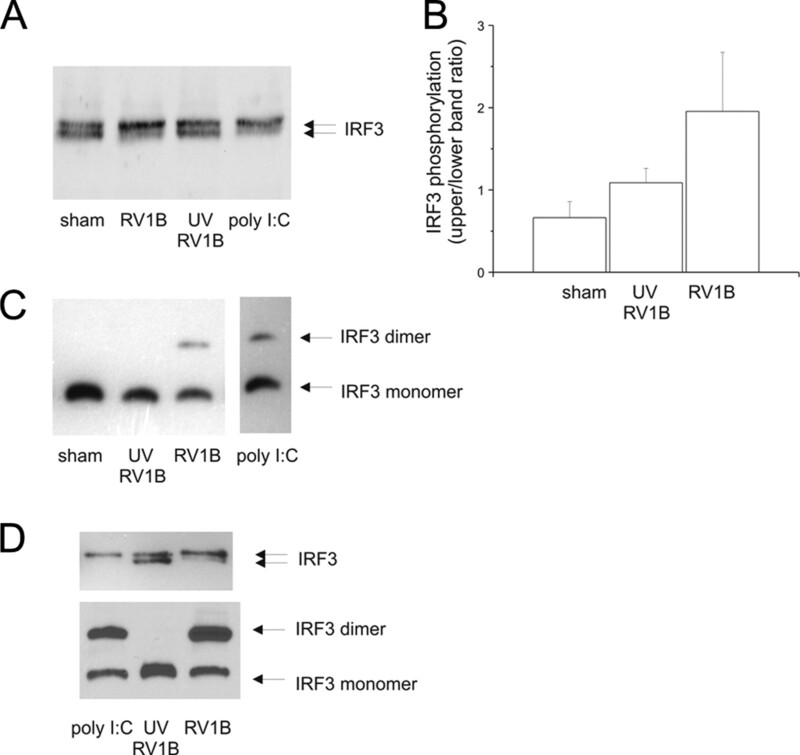 RV1B-induced protein expression of IFNs and ISGs. BEAS-2B cells were grown to near confluence and infected with RV1B, UV-irradiated RV1B, or sham-infected. A–C, Medium supernatants were extracted 24 h after infection for ELISA to determine the expression of IFN-λ1, IP-10, and IL-8. D, Protein lysates were used to determine IRF7 expression by immunoblotting. RV1B-induced expression of IFNs, ISGs, and chemokines in primary tracheobronchial epithelial cells. Primary tracheobronchial epithelial cells were grown to near confluence and infected with RV1B or sham. A, Total RNA was extracted 24 h after infection, and the expression of IFN-β, IFN-λ1, IFN-λ2/3, IRF7, IP-10, IL-8, and GM-CSF was determined by qPCR. Expression levels are represented as the ratio of the response to intact RV vs the response to sham. The y-axis is in log scale. Symbols represent the results of three different experiments. B–G, Time course of RV1B-induced responses in primary cells. Viral dsRNA generated during replication may be detected by the PRRs RIG-I, MDA5, and/or TLR3. To determine which PRR is responsible for sensing RV dsRNA and inducing the innate immune response, we used siRNA against RIG-I, MDA5, and the TLR3 adaptor protein TRIF/TIR domain-containing adapter molecule. Forty-eight h later, cells were infected with RV1B, UV-irradiated RV-1B, or sham HeLa cell lysate, and the expression of IFNs and ISGs was measured by qPCR 24 h after infection. RIG-I expression was knocked down by 80–90% after treatment with RIG-I siRNA (Fig. 4⇓A). Immunoblots also showed a significant increase in RIG-I protein expression with RV1B treatment, suggesting that expression of RIG-I is inducible. RIG-I siRNA had a slight inhibitory effect on the expression of its homolog protein, MDA5 (Fig. 4⇓B). However, RIG-I siRNA failed to decrease RV-induced expression of IFNs or ISGs compared with nontargeting siRNA, suggesting that RIG-I is not required for sensing RV dsRNA (Fig. 5⇓). RIG-I and MDA5 siRNA knockdown efficiencies. A and B, RIG-I or nontargeting siRNA was transfected into BEAS-2B cells. After transfection, cells were infected with RV1B, UV-irradiated RV1B (UV-RV1B) or sham. After infection, cell lysates were probed with Abs against RIG-I (A) or MDA5 (B). Note the inductions in RIG-I and MDA5 expression with intact RV, as well as the apparent degradation of MDA-5 following viral infection. C and D, MDA5 or nontargeting siRNA was transfected into BEAS-2B cells. After transfection, cells were infected with RV1B, UV-irradiated RV1B (UV-RV1B), or sham infected. After infection, cell lysates were probed with Abs against either MDA5 (C) or RIG-I (D). Blots are representative of three separate experiments. 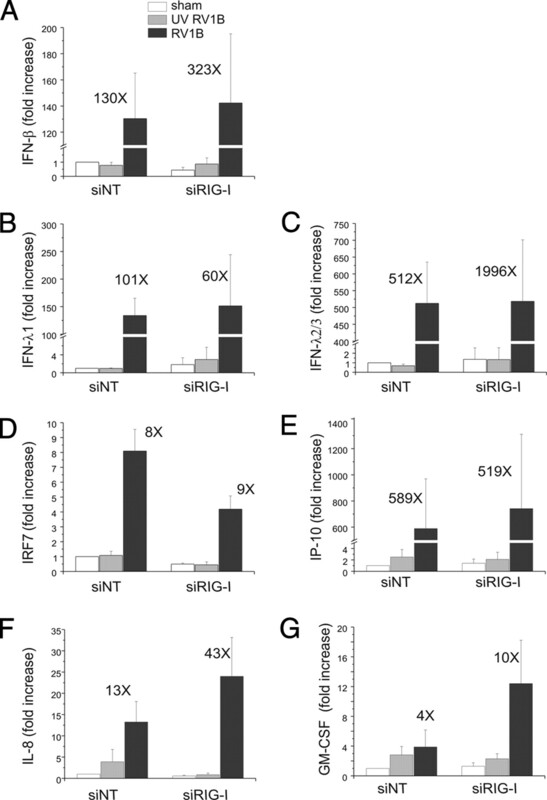 siRNA against RIG-I does not block RV1B-induced IFN and ISG expression. RIG-I-specific or nontargeting siRNA was transfected into BEAS-2B cells. After transfection, cells were infected with RV1B, UV-irradiated RV1B (UV-RV1B), or sham infected. A–G, Total RNA was extracted, and the expression of IFN-β, IFN-λ1, IFN-λ2/3, IRF7, IP-10, IL-8, and GM-CSF was determined by qPCR. The expression of each target gene was normalized to GAPDH. Expression levels are represented as the fold increase vs sham-infected, nontargeting siRNA-transfected cells. The y-axis has been broken to show the effects of siRNA on both basal and maximal gene expression. Bars, means ± SEM for four experiments; numbers over bars indicate the fold increase (×) compared with sham-infected sample within its own siRNA group. ∗, p < 0.05 vs RIG-I siRNA-transfected RV1B-infected sample, ANOVA. siNT, Non-targeting siRNA; siRIG-I, siRNA against RIG-I. Next, we knocked down MDA5 expression using MDA5 siRNA (Fig. 4⇑C). Again, an 80–90% knockdown efficiency was achieved. MDA5 protein expression was also induced by RV1B infection. MDA5 siRNA had no effect on RIG-I protein expression (Fig. 4⇑D). After transfection with MDA5 siRNA, there were significant decreases in RV1B-induced IFN-β, IFN-λ1, and IFN-λ2/3 mRNA expression and IFN-λ1 protein expression compared with cells transfected with nontargeting siRNA (Fig. 6⇓). MDA5 siRNA also decreased RV1B-induced mRNA expression of the ISGs IRF7 and IP-10/CXCL10. Unlike IFNs, MDA5 siRNA treatment was associated with a paradoxic increase in RV1B-induced expression of IL-8 and GM-CSF. Together, these data suggest that MDA5, but not RIG-I, is required for maximal RV-induced IFN responses, but not for RV-induced cytokine responses. siRNA against MDA5 blocks RV1B-induced IFN and ISG expression. MDA5-specific or nontargeting siRNA was transfected into BEAS-2B cells. After transfection, cells were infected with RV1B, UV-irradiated RV1B (UV-RV1B), or sham infected. A–G, Total RNA was extracted and the expression of IFN-β, IFN-λ1, IFN-λ2/3, IRF7, IP-10, IL-8 and GM-CSF was determined by qPCR. The expression of each target gene was normalized to GAPDH. Expression levels are represented as the fold increase vs sham-infected, nontargeting siRNA-transfected cells. The y-axis has been broken to show the effects of siRNA on both basal and maximal gene expression. H, To determine the protein expression of IFN-λ1, cell supernatants were collected 24 h after infection for ELISA. Bars represent mean ± SEM for three to five experiments; numbers over bars indicate the fold increase compared with sham-infected sample within its own siRNA group. ∗, p < 0.05 vs MDA5 siRNA-transfected RV-infected sample, ANOVA. siNT, Non-targeting siRNA; siMDA-5, siRNA against MDA-5. To examine whether MDA5 is also required for major group RV-induced IFN responses, we repeated our experiment using RV39. BEAS-2B cells were transfected with either MDA5 or nontargeting siRNA and then infected with RV39, UV-irradiated RV39 or sham HeLa cell lysate. Twenty-four hours after infection, cellular RNA was extracted to measure the expression of IFNs and ISGs by quantitative PCR (Fig. 7⇓). There was a significant decrease in mRNA expression of IFN-β, IFN-λ1, and IFN-λ2/3 in cells transfected with MDA5 siRNA compared with cells transfected with nontargeting siRNA. MDA5 siRNA also decreased RV39-induced mRNA expression of the ISGs IRF7 and IP-10/CXCL10. siRNA against MDA5 blocks RV39-induced IFN and ISG expression. A–G, Total RNA was extracted, and the expression of IFN-β, IFN-λ1, IFN-λ2/3, IRF7, IP-10, IL-8, and GM-CSF was determined by qPCR. The expression of each target gene was normalized to GAPDH. Expression levels are represented as the fold increase vs sham-infected, nontargeting siRNA-transfected cells. The y-axis has been broken to show the effects of siRNA on both basal and maximal gene expression. Bars, means ± SEM for three experiments; numbers over bars indicate the fold increase (×) compared with sham-infected sample within its own siRNA group. ∗, p < 0.05 vs MDA5 siRNA-transfected RV-infected sample, ANOVA. siNT, Non-targeting siRNA; siMDA-5, siRNA against MDA-5. We then sought to determine whether MDA-5 is required for the recognition of viral dsRNA in primary tracheal epithelial cells as in BEAS-2B cells. Primary cells were cultured until 70% confluent and then transfected with siRNA against MDA5 or nontargeting siRNA. After 48 h, cells were infected with RV1B or UV-irradiated RV1B. Cellular mRNA was extracted 24 h after infection to determine mRNA expression by qPCR. Compared with nontargeting siRNA, MDA5 siRNA decreased RV1B-induced expression of IFN-β, IFN-λ1, IFN-λ2/3, IRF7, and IP-10/CXCL10 (Fig. 8⇓). These data confirm that MDA5 is required for sensing RV dsRNA and induction of the subsequent IFN response in primary cells. siRNA against MDA5 blocks RV1B-induced IFN responses in primary tracheal epithelial cells. A, MDA5 siRNA or nontargeting siRNA was transfected into primary tracheobronchial epithelial cells. After transfection, cells were infected with RV1B or UV-irradiated RV1B. After infection, cell lysates were probed with anti-MDA5 Ab. Blot is typical for three experiments. B–H, Total RNA was extracted and the expression of IFN-β, IFN-λ1, IFN-λ2/3, IRF7, IP-10, IL-8, and GM-CSF was determined by qPCR. The expression of each target gene was normalized to GAPDH. Expression levels are represented as the fold increase vs cells treated with UV-irradiated virus and nontargeting siRNA. The y-axis has been broken to show the effects of siRNA on both basal and maximal gene expression. Bars, means ± SEM for three experiments; numbers over bars indicate the fold increase (×) compared with sham-infected sample within its own siRNA group. ∗, p < 0.05 vs MDA5 siRNA-transfected RV-infected sample, ANOVA. siNT, Non-targeting siRNA; siMDA-5, siRNA against MDA-5. Next. we blocked TLR3 signaling using siRNA against TRIF/TIR domain-containing adapter molecule, the TLR3 adaptor molecule. Again, a high knockdown efficiency was verified by immunoblotting (Fig. 9⇓). Like MDA5 siRNA, TRIF siRNA abolished RV1B-induced expression of IFN-β, IFN-λ1, IFN-λ2/3, IRF7, and IP-10/CXCL10, suggesting that TLR3 signaling is also required for maximal RV1B-induced IFN responses. siRNA against TRIF blocks RV-induced IFN and ISG expression. A, TRIF siRNA or nontargeting siRNA was transfected into BEAS-2B cells. After transfection, cells were infected with RV1B, UV-irradiated RV1B, or sham infected. After infection, cell lysates were probed with anti-TRIF Ab. B–H, Total RNA was extracted and the expression of IFN-β, IFN-λ1, IFN-λ2/3, IRF7, IP-10, IL-8, and GM-CSF was determined by qPCR. The expression of each target gene was normalized to GAPDH. Expression levels are represented as the fold increase vs sham-infected, nontargeting siRNA-transfected cells. The y-axis has been broken to show the effects of siRNA on both basal and maximal gene expression. The blot shown is a typical representative of 3 separate experiments. Bars, means ± SEM for four experiments; numbers over bars indicate the fold increase (×) compared with sham-infected sample within its own siRNA group. ∗, p < 0.05 vs TRIF siRNA-transfected RV-infected sample, ANOVA. siNT, Non-targeting siRNA; siTRIF, siRNA against TRIF. IRF3 is a ubiquitously expressed transcription factor that regulates type I IFN production. To test whether RV1B induces IRF3 activation, BEAS-2B cells were infected with RV1B or UV-irradiated RV1B. Cell protein lysates were collected 12 h after infection. IRF3 phosphorylation shift was determined by SDS-PAGE followed by immunoblotting using anti-IRF3 Ab (Fig. 10⇓, A and B), and IRF3 dimerization determined by native PAGE (Fig. 10⇓C). Poly(IC), a synthetic dsRNA that induces both IRF3 phosphorylation and dimerization, served as a positive control. We found that RV1B, but not UV-irradiated RV1B, induced IRF3 phosphorylation and dimerization. Similar results were observed in primary tracheal epithelial cells (Fig. 10⇓D). RV-induced IRF3 activation in cultured BEAS-2B and primary airway epithelial cells. A, BEAS-2B cells were infected with RV1B or UV-irradiated RV1B (1 h at 33°C) at a multiplicity of infection of 10. Cell lysates were collected and probed with anti-IRF3 Ab. Poly(IC) served as a positive control. IRF3 protein is visualized as two bands, an upper phosphorylated form and a lower unphosphorylated form. B, Densitometry of IRF3 phosphorylation is provided. Bars, means ± SEM for three experiments. C, Cellular proteins were also subjected to native-PAGE to resolve the dimerization of IRF3. Poly(IC) served as a positive control. IRF protein is visualized as two bands, an upper dimer and a lower monomer. Blot is representative of five individual experiments. D, Primary tracheobronchial epithelial cells were infected with RV1B or UV-irradiated RV1B. Top, Cell lysates were collected 12 h after infection and probed with anti-IRF3 Ab. Poly(IC) served as a positive control. Bottom, Cellular proteins were subjected to native-PAGE to resolve the dimerization of IRF3. Poly(IC) served as a positive control. Blots are representative of three experiments. We then examined the requirement of IRF3 in RV-induced IFN responses using siRNA against IRF3. IRF3 protein abundance was substantially knocked down by IRF3 siRNA (Fig. 11⇓). IRF3 siRNA nearly abolished RV1B-induced expression of IFNs-β, λ1, and 2, 3; IRF7; and IP-10/CXCL10. However, there was no effect on IL-8 or GM-CSF expression. 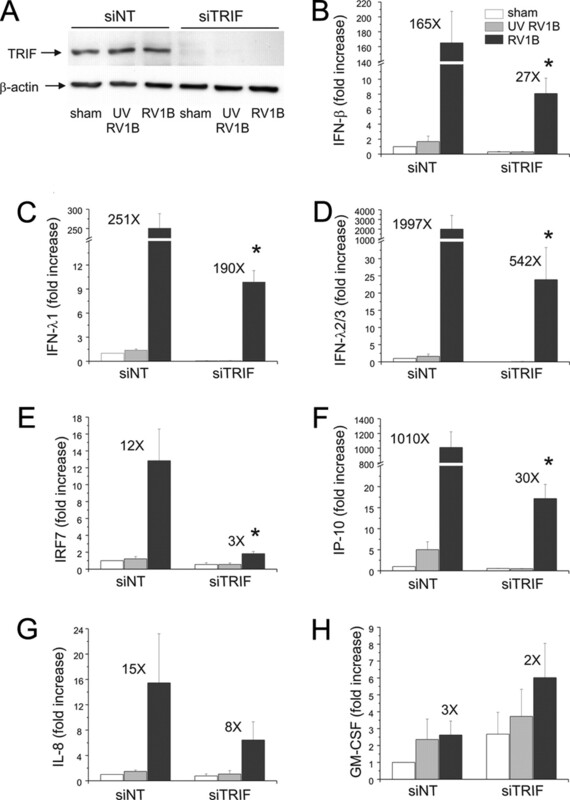 Taken together, these data suggest that IRF3 is activated by RV1B and that IRF3 is required for RV-induced IFN responses, as well as the expression of ISGs such as IRF7 and IP-10. 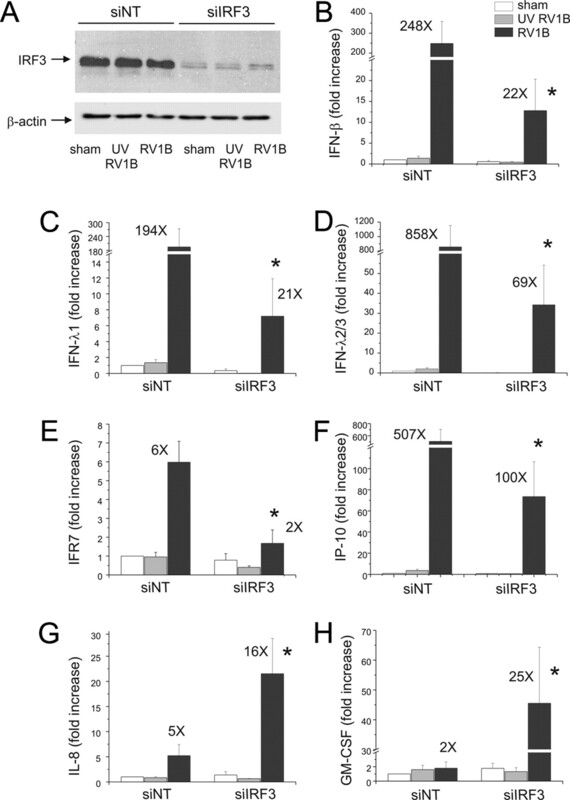 siRNA against IRF3 blocks RV-induced IFN and ISG expression. A, IRF3 siRNA or nontargeting siRNA was transfected into BEAS-2B while seeding. After transfection, cells were infected with RV1B, UV-irradiated RV1B (UV-RV1B) or sham. A, After infection, cell lysates were probed with anti-IRF3 Ab. Blot is representative of three separate experiments. B–H, Total RNA was extracted and the expression of IFN-β, IFN-λ1, IFN-λ2/3, IRF7, IP-10, IL-8, and GM-CSF was determined by qPCR. The expression of each target gene was normalized to GAPDH. Expression levels are represented as the fold increase vs sham-infected, nontargeting siRNA-transfected cells. The y-axis has been broken to show the effects of siRNA on both basal and maximal gene expression. Bars, means ± SEM for four experiments; numbers over bars indicate the fold increase (×) compared with the sham-infected sample within its own siRNA group. ∗, p < 0.05 vs nontargeting siRNA-transfected RV1B-infected cells, one-way ANOVA. siNT, Non-targeting siRNA; siRF3, siRNA against IRF-3. RIG-I/MDA5 and TLR3 signaling pathways converge on a common TNF receptor-associated factor 3 adapter complex, which then activates two IRF3 kinases, TANK-binding kinase and IKK-ε (7). To examine whether IRF3 functions downstream of MDA5 in airway epithelial cells, BEAS-2B cells were transfected with either MDA5 siRNA or nontargeting siRNA and then infected with RV1B, UV-irradiated RV1B, or sham HeLa cell lysate. IRF3 dimerization was resolved by native PAGE (Fig. 12⇓). We found that MDA5 and TRIF siRNA each caused a partial reduction in RV-induced IRF3 dimerization compared with nontargeting siRNA-transfected cells, confirming in airway epithelial cells the general notion that IRF3 functions downstream of MDA5 and TRIF. siRNA against TRIF and MDA5 but not RIG-I reduced RV1B-induced IRF3 dimerization. A, RIG-I, MDA5, TRIF siRNA or nontargeting siRNA was transfected into BEAS-2B. After transfection, cells were infected with RV1B, UV-irradiated RV1B, or sham infected. After infection, cell lysates were probed with anti-IRF3 Ab. Poly(IC) served as a positive control. B, IRF3 dimer to monomer ratio was quantified by densitometry. Blot is representative of two experiments. siNT, Non-targeting siRNA; siTRIF, siRNA against TRIF; siMDA-5, siRNA against MDA-5; siRIG-I, siRNA against RIG-I. Host pathogen recognition, as reflected by the induction of type I IFNs, is mediated by activation of PRRs. The membrane dsRNA receptor, TLR3, and the recently identified cytoplasmic dsRNA receptors, RIG-I and MDA5, are responsible for sensing viral dsRNA (2, 3, 4). Although all three receptors can recognize viral dsRNA, the engagement of receptor and viral dsRNA seem to be cell type and virus specific. 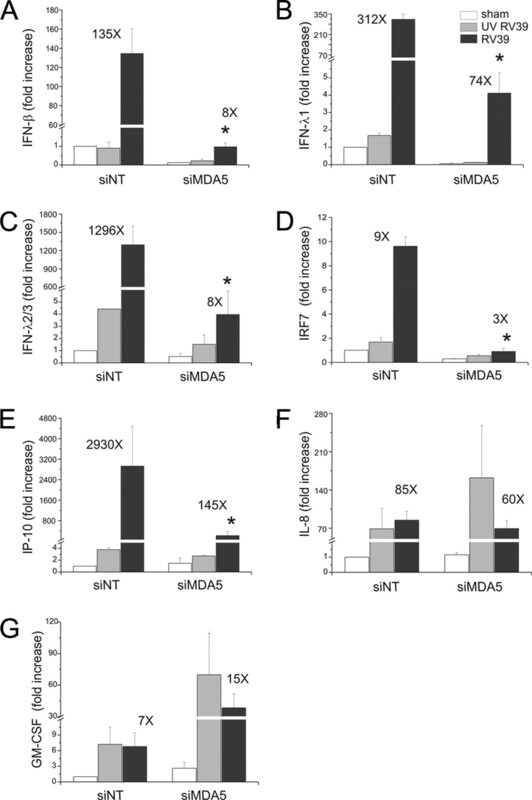 RIG-I-deficient mice fail to produce type I IFNs in response to the negative-sense ssRNA viruses Newcastle disease virus, Sendai virus, vesicular stomatitis virus, and influenza virus and to the positive-sense ssRNA Japanese encephalitis virus, whereas MDA5-deficient mice fail to detect EMCV, a positive-sense ssRNA picornavirus (9). Whereas MDA5 is essential for induction of type I IFNs after infection with EMCV in fibroblasts and conventional DCs, plasmacytoid DCs use the TLR system for viral detection (9). Although these results are compelling, it seems premature to conclude that all picornaviruses are sensed by MDA5 in all cell types, because only cardioviruses have been studied. In this article, we found that infection of BEAS-2B and primary tracheal epithelial cells with RV induced substantial increases in IFN and ISG mRNA expression. In limited studies, we also found similar changes in gene expression after infection with major and minor group virus. Due to the low level of baseline IFN expression, the fold increases in IFN expression were quite high, perhaps artificially so. However, increases in IFN-λ1, IP-10/CXCL-10, RIG-I, and MDA5 were verified by ELISA and immunoblotting, implying that RV significantly increases IFN responses in airway epithelial cells. Further, we demonstrate for the first time that MDA5 and TRIF, but not RIG-I, are required for maximal sensing RV dsRNA in human airway epithelial cells. Transfection of both a human bronchial epithelial cell line (BEAS-2B cells) and primary tracheobronchial epithelial cells with siRNA against MDA5, but not nontargeting siRNA, significantly inhibited RV1B-induced expression of a type I IFN, IFN-β, as well as a number of ISGs. Knockdown of MDA5 also attenuated expression of the type III IFNs IFN-λ1 and IFN-λ2/3, which functionally resemble type I IFNs (17) and are also induced by RV infection (18). These data are in agreement with previous data suggesting that MDA5 is required for sensing picornavirus dsRNA (9). Alternatively, our data contrast with previous data from A549 alveolar type II epithelial cells showing that RIG-I and TLR3, but not MDA5, are required for sensing human respiratory syncytial virus, a paramyxovirus (8). Thus, in the airway epithelium, recognition of viral dsRNA is indeed virus type specific. We also examined the contribution of IRF3 to RV-induced responses in airway epithelial cells. IRF3 siRNA nearly abolished IFN and ISG expression. MDA5 and TRIF knockdown also decreased IRF3 dimerization. These data are consistent with the idea that TLR3 and MDA5 regulate IFN expression via a common downstream intermediate, IRF3. In contrast to siRNA against MDA5, siRNA against RIG-I had no effect on RV-induced IRF3 dimerization or IFN expression. The divergent roles of RIG-I and MDA5 in the context of RV infection suggest that the two homologous helicases function distinctly from each other. Further, although RIG-I expression was induced after RV infection, RIG-I apparently cannot compensate for reduced expression and/or function of MDA5. Using siRNA against MDA5 and IRF3, we found that MDA5/IRF3 signaling is required for RV-induced IFN, but not IL-8 expression. Indeed, expression of IL-8 and GM-CSF were often paradoxically increased. Previous studies have shown that RV-induced IL-8 expression is strictly regulated by the transcription factor NF-κB (14, 19). The initial phase of IL-8 expression is also replication independent (14, 20, 21, 22). Inhibition of dsRNA sensing would therefore not be expected to reduce IL-8 expression. Further, the up-regulation of proinflammatory cytokine expression following MDA5 and IRF3 knockdown may represent a compensatory mechanism by which the airway epithelial cells increase immunosurveillance when the IFN response is suppressed. We previously showed that TLR3 was partially required for RV39-induced IL-8 expression in 16HBE14o− cells (12). In this study, we could not verify TLR3 knockdown by immunoblotting or flow cytometry in BEAS-2B cells (not shown), leading us to use siRNA against TRIF. In contrast to MDA5 knockdown, inhibition of TLR3 signaling using TRIF siRNA inhibited both IFN and IL-8 expression. Based on our previous result, the complete effect of TRIF siRNA on IFN signaling was unexpected. It is conceivable that TRIF is coupled to other, as yet unknown pattern recognition receptors and that the reduction in IFN expression induced by TRIF knockdown is not solely due to TLR3-linked signaling. In any event, the differential effects of MDA5 and TRIF siRNA on IL-8 expression suggest that, although NF-κB and IRF3 are both components of the same transcriptional enhanceosome in the regulation of IFNs, ISGs, and inflammatory cytokine IL-8 (23, 24), their requirement for gene expression may vary for different target genes, perhaps depending on the organization of IFN-stimulated and NF-κB response elements in the promoter. It has recently been reported that picornaviruses may develop strategies to escape host immune surveillance. Hepatitis A virus has been shown to suppress RIG-I-mediated signaling in fetal rhesus monkey kidney (FRhK-4) cells (25). Poliovirus infection induces cleavage of MDA5 in HeLa cells (26). In A549 human alveolar type II alveolar epithelial cells, RV14 infection fails to induce high levels of IFN, apparently by interfering with IRF3 dimerization (27). In this study, RV1B induced robust IRF3 dimerization and IFN responses in both BEAS-2B and primary bronchial epithelial cells. Also, although we did indeed observe apparent degradation of MDA5 following viral infection (Fig. 5⇑), the total protein abundance of MDA5 was still substantially increased 24 h after RV inoculation. Taken together, these data suggest an intact host innate immune defense against RV1B dsRNA. We confined most of our studies of RV-induced IFN responses to the minor group serotype RV1B. However, IFN expression by RV39, a major group virus, was also blocked by MDA5 but not RIG-I siRNA. This was not unexpected, given that RV1B and RV16, another major group serotype, have been shown to induce nearly identical patterns of gene expression in primary cultured airway epithelial cells (28). We have found that infection with RV1B and RV39 induce similar levels of Akt phosphorylation and IL-8 expression in cultured 16HBE14o− human bronchial epithelial cells, and that inhibition of PI 3-kinase blocks both RV1B- and RV39-induced IL-8 expression induced by either virus (29). Thus, there are ample data suggesting that major and minor subgroup RVs stimulate similar airway epithelial cell signaling pathways and elicit similar immune responses. In conclusion, we have shown for the first time that MDA5, TLR3, and IRF3 are each required for maximal RV-induced IFN responses. Viral infections, most commonly caused by RV, are the most frequent cause of asthma exacerbations and account for a substantial percentage of chronic obstructive pulmonary disease exacerbations (1). Bronchial epithelial cells isolated from patients with asthma have been demonstrated to have an incomplete innate immune response to rhinovirus infection, with deficient type I IFN-β and type III IFN-λ production (18, 30). Further understanding of the biochemical signaling pathways regulating RV-induced IFN expression may therefore provide insight into the pathogenesis of human airway diseases and new therapeutic targets for treatment. We thank Drs. Nathalie Grandvaux and John Hiscott (McGill University, Montreal Canada) for their advice in the measurement of IRF3 dimerization. ↵1 This work was supported by National Institutes of Health Grants HL81420 and 82550 (to M.B.H.). ↵3 Abbreviations used in this paper: RV, rhinovirus; TRIF, TIR-domain-containing adapter-inducing IFN-β; RIG, retinoic acid-inducible gene; MDA, melanoma differentiation-associated gene; IKK, IκB kinase; IRF, IFN response factor; IP-10, 10-kDa IFN-γ-inducible protein; EMCV, encephalomyocarditis; DC, dendritic cell; BEGM, bronchial epithelial growth medium; ISG, IFN-stimulated gene; TIR, Toll/IL-1R homologous region; PRR, pattern recognition receptor; poly(IC), polyinosinic-polyadenylic acid. Hershenson, M. B., S. L. Johnston. 2006. Rhinovirus infections: More than a common cold. Am. J. Respir. Crit. Care Med. 174: 1284-1285. Andrejeva, J., K. S. Childs, D. F. Young, T. S. Carlos, N. Stock, S. Goodbourn, R. E. Randall. 2004. The V proteins of paramyxoviruses bind the IFN-inducible RNA helicase, MDA-5, and inhibit its activation of the IFN-β promoter. Proc. Natl. Acad. Sci. USA 101: 17264-17269. Xu, L.-G., Y.-Y. Wang, K.-J. Han, L.-Y. Li, Z. Zhai, H.-B. Shu. 2005. VISA is an adapter protein required for virus-triggered IFN-β signaling. Mol. Cell 19: 727-740. Liu, P., M. Jamaluddin, K. Li, R. P. Garofalo, A. Casola, A. R. Brasier. 2007. Retinoic acid inducible gene-I mediates early anti-viral response and Toll like receptor 3 expression in respiratory syncytial virus-infected airway epithelial cells. J. Virol. 81: 1401-1411. Sha, Q., A. Q. Truong-Tran, J. R. Plitt, L. A. Beck, R. P. Schleimer. 2004. Activation of airway epithelial cells by Toll-like receptor agonists. Am. J. Respir. Cell Mol. Biol. 31: 358-364. Sajjan, U. S., Y. Jia, D. C. Newcomb, J. K. Bentley, N. W. Lukacs, J. J. LiPuma, M. B. Hershenson. 2006. H. influenzae potentiates airway epithelial cell responses to rhinovirus by increasing ICAM-1 and TLR3 expression. FASEB J. 20: 2121-2123. Zhu, L., P.-k. Lee, W.-M. Lee, Y. Zhao, D. Yu, Y. Chen. 2009. Rhinovirus induced major airway mucin production involves a novel TLR3-EGFR dependent pathway. Am. J. Respir. Cell Mol. Biol. 40: 610-619. Papi, A., S. L. Johnston. 1999. Rhinovirus infection induces expression of its own receptor intercellular adhesion molecule 1 via increased NF-κB-mediated transcription. J. Biol. Chem. 274: 9707-9720. Kotenko, S. V., G. Gallagher, V. V. Baurin, A. Lewis-Antes, M. Shen, N. K. Shah, J. A. Langer, F. Sheikh, H. Dickensheets, R. P. Donnelly. 2003. IFN-λs mediate antiviral protection through a distinct class II cytokine receptor complex. Nat. Immunol. 4: 69-77. Contoli, M., S. D. Message, V. Laza-Stanca, M. R. Edwards, P. A. Wark, N. W. Bartlett, T. Kebadze, P. Mallia, L. A. Stanciu, H. L. Parker, et al 2006. Role of deficient type III interferon-λ production in asthma exacerbations. Nat. Med. 12: 1023-1026. Zhu, Z., W. Tang, J. M. Gwaltney, Y. Wu, J. A. Elias. 1997. Rhinovirus stimulation of interleukin-8 in vivo and in vitro: role of NF-kappaB. Am. J. Physiol. Lung Cell Mol. Physiol. 273: L814-L824. Suzuki, T., M. Yamaya, K. Sekizawa, M. Hosoda, N. Yamada, S. Ishizuka, K. Nakayama, M. Yanai, Y. Numazaki, H. Sasaki. 2001. Bafilomycin A(1) inhibits rhinovirus infection in human airway epithelium: effects on endosome and ICAM-1. Am. J. Physiol. Lung Cell Mol. Physiol. 280: L1115-L1127. Kaul, P., M. C. Biagioli, I. Singh, R. B. Turner. 2000. Rhinovirus-induced oxidative stress and interleukin-8 elaboration involves p47phox but is independent of attachment to intercellular adhesion molecule-1 and viral replication. J. Infect. Dis. 181: 1885-1890. Ohmori, Y., T. A. Hamilton. 1993. Cooperative interaction between interferon (IFN) stimulus response element and κB sequence motifs controls IFNγ- and lipopolysaccharide-stimulated transcription from the murine IP-10 promoter. J. Biol. Chem. 268: 6677-6688. Casola, A., R. P. Garofalo, M. Jamaluddin, S. Vlahopoulos, A. R. Brasier. 2000. Requirement of a novel upstream response element in respiratory syncytial virus-induced IL-8 gene expression. J. Immunol. 164: 5944-5951. Fensterl, V., D. Grotheer, I. Berk, S. Schlemminger, A. Vallbracht, A. Dotzauer. 2005. Hepatitis A virus suppresses RIG-I-mediated IRF-3 activation to block induction of β interferon. J. Virol. 79: 10968-10977. Barral, P. M., J. M. Morrison, J. Drahos, P. Gupta, D. Sarkar, P. B. Fisher, V. R. Racaniello. 2007. MDA-5 is cleaved in poliovirus-infected cells. J. Virol. 81: 3677-3684. Kotla, S., T. Peng, R. E. Bumgarner, K. E. Gustin. 2008. Attenuation of the type I interferon response in cells infected with human rhinovirus. Virology 374: 399-410. Chen, Y., E. Hamati, P.-K. Lee, W.-M. Lee, S. Wachi, D. Schnurr, S. Yagi, G. Dolganov, H. Boushey, P. Avila, R. Wu. 2006. Rhinovirus induces airway epithelial gene expression through double-stranded RNA and IFN-dependent pathways. Am. J. Respir. Cell Mol. Biol. 34: 192-203. Newcomb, D. C., U. S. Sajjan, D. R. Nagarkar, Q. Wang, S. Nanua, Y. Zhou, C. L. McHenry, K. T. Hennrick, W. C. Tsai, J. K. Bentley, et al 2008. Human rhinovirus 1B exposure induces phosphatidylinositol 3-kinase-dependent airway inflammation in mice. Am. J. Respir. Crit. Care Med. 177: 1111-1121. Wark, P. A. B., S. L. Johnston, F. Bucchieri, R. Powell, S. Puddicombe, V. Laza-Stanca, S. T. Holgate, D. E. Davies. 2005. Asthmatic bronchial epithelial cells have a deficient innate immune response to infection with rhinovirus. J. Exp. Med. 201: 937-947.